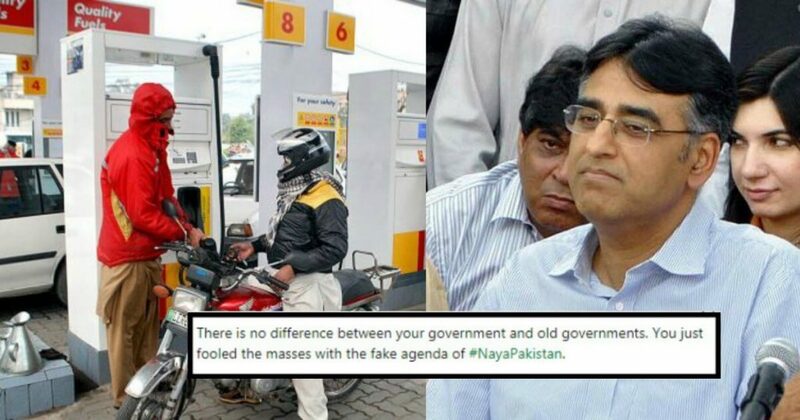 The federal government of Pakistan increased the petrol and diesel prices by up to Rs. 6 per liter and kerosene and light diesel oil (LDO) prices by three rupees a liter on Sunday for April 2019 effective from today till 3oth April 2019 midnight. According to the government, the oil prices in Pakistan is increased in line with fluctuation in global oil prices. With this increase, the price of diesel has been inflated from Rs. 111.43 to Rs. 117. 43 per liter, petrol from Rs. 92.89 to Rs. 98.89 per liter, LDO from Rs. 77. 54 to Rs. 80.54 per liter and kerosene from Rs. 86. 31 to Rs. 89.31 per liter. It is worth mentioning that the Oil And Gas Regulatory Authority (OGRA) has suggested the government to increase the petroleum price by Rs. 11.98 per liter and high-speed diesel by Rs. 11.17 per liter for April 2019. However, the government increased the prices of petrol and high-speed diesel by Rs. 6 per liter. Economists believe that with this increase in oil prices, inflationary pressure would go up which obviously affect the masses. Opposition Leaders Slams Government For Hike In Oil And Diesel Prices! 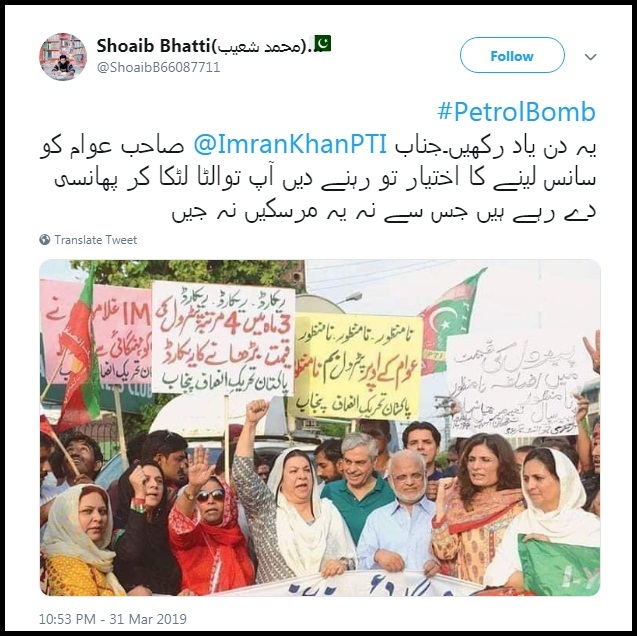 On The Other Hand, People On Social Media Are Sharing The Old Pictures Of PTI Leaders When They Protested Against PML-N For Increase In Oil Prices! No Bro, It Is Not A Prank! 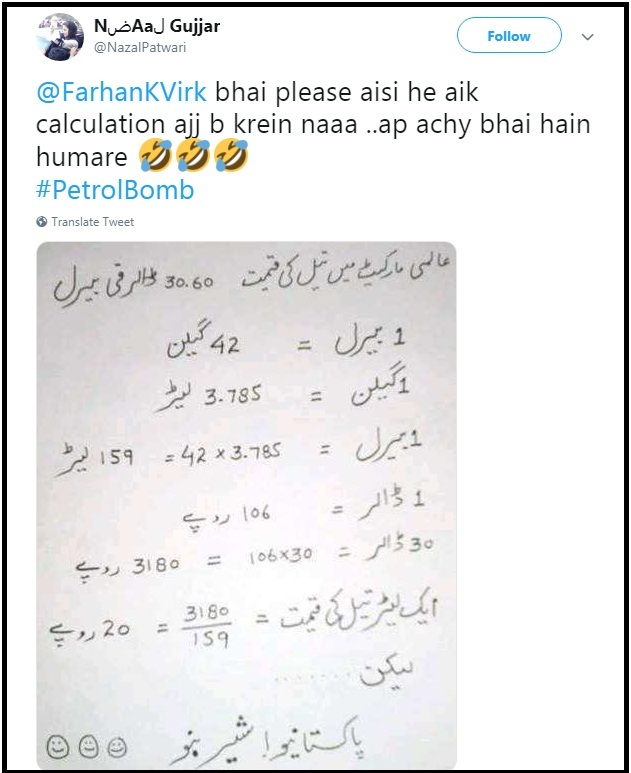 People Are Demanding From Social Media Activist Farhan Virk To Provide A Detail Analysis! From Where Do We Get This ‘Firm Believer’? According to Pakistan Today, a petitioner has challenged in Lahore High Court (LHC) for the hike in oil prices. The petitioner said that the government’s claim regarding the increase in the prices across the world was baseless. “The increase in petroleum products’ prices by the government was due to additional sales tax collection, adding that due to scaling up prices, inflation would also be increased across the country”, argued the petitioner. He further said that in the rest of the world, petroleum prices had been reduced while they had been increased in Pakistan. Last week, Prime Minister Imran Khan made a huge announcement for Pakistanis in which he said that Asia’s largest oil and gas reserves may soon be discovered in Karachi’s offshore waters. 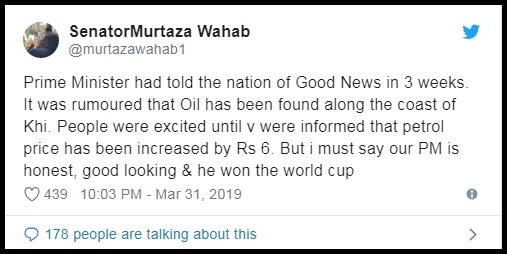 But according to social media users, this increase in oil and diesel prices shows that the experts who were in denial of such discovery were saying right. However, people are not happy with the decision. 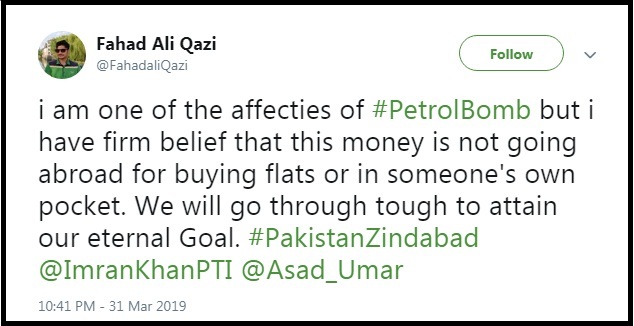 Prime Minister Pakistan Imran Khan and Finance Minister Asad Umar are facing criticism from all over the country for the latest hike in oil and diesel prices. Let’s see if Imran Khan talks about it on the national TV to justify his point and satisfy his followers.